The Atlanta Journal's Jeff Schultz has joined a recent media mini-parade in asking Damon Evans to give Dennis Felton another year as Georgia's basketball coach. Schultz joins Mark Bradley (AJC), John Kaltefleiter (ABH), Mark Schlabach (ESPN), and Gary Parrish (Sportsline) in supporting Felton getting one more shot at this thing. 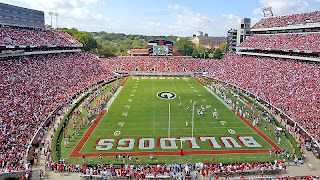 Players that plan on playing for Georgia next year are paying close attention, too. Howard Thompkins III, one of the top 10 power forwards in the nation according to scout.com and rivals.com, signed with the Bulldogs during the early period back in November along with two other prospects. He said nobody from Georgia has talked to him about Felton's status but he's certainly heard a lot about it from other people. "If they make a change I plan on staying but I'd have to evaluate who the new coach is going to be and find out what his coaching style is," said Thompkins, who averaged 28 points and 10 rebounds for Class AA state champion Wesleyan this season. "But Coach Felton is the main reason I committed to Georgia. That and the teammates I'm going to have and the ones I'm going to bring with me. They aren't going anywhere as far as I can tell." That's about as positive of a comment as you can get in this situation. The worst thing that could happen would be to make a change and then lose your best recruits. His comments match other info that I've heard on the topic. I think all media know it's coming, and are just posturing to be able to write their vitriolic post-mortems. UGA is trying to give this game away to Ole Miss. wow... fouled them shooting for 3 at the end of regulation and in overtime and we still escaped. If any of the columnists that have supported Dennis Felton watched the game tonight, they would realize that he needs to go. I am happy that we won, but the bush-league, keystone cops crap that we pulled the last five minutes of regulation is the reason why Felton is not a big-time coach. I am happy that we won, but hate that it masks Felton's obvious ineptitude.